If you’re on the lookout for an alternative to the likes of the Renault Kadjar and the Nissan Qashqai, the SEAT Ateca SUV is not simply a shot in the dark. As the brand’s first ever large SUV, it’s comfortable, affordable, spacious and should give you real food for thought. Although it’s SEAT’s first large SUV, it isn’t parent company Volkswagen Group’s first. As such, the car shares its underpinnings with the VW Tiguan – and we’d wager that this is a better proposition. OSV takes a closer look at what it’s all about with our SEAT Ateca SUV review. Remember the days when bulky SUV’s drove like tanks and lacked precision or acceleration? Fortunately, those days are well and truly over. This SEAT SUV can boast light but exact steering, allowing you to tackle bends with confidence. The suspension is a tad too firm for us, but it’s in no way uncomfortable. On longer motorway cruisers you’d probably like a bit more give, but the car is well composed at corners. There is a switch on the centre console that allows you to change the response from your accelerator pedal, the speed of the gear shift and the weight of your steering. In terms of the engines, the 1.6-litre diesel power plant gets the thumbs up. It’s the same unit you’ll find in the SEAT Leon as well as other VW models, and it can get this hulking mass from rest to 62mph in just 10.5 seconds. It’s full of oomph, and it’s the cheapest to run in the entire range. There is also a 2.0-litre diesel engine available which comes in either 148bhp or 178bhp guise. The latter comes with four-wheel-drive which, although it will raise running costs, will add some steel to this car in extreme conditions. You can pair it up with a manual or automatic ‘box, but if you opt for 4WD, you can’t mate it with the automatic. The engine takes 8.5 seconds to get from rest to 62mph. There are a couple of petrol engines available, including a 1.4-litre TSI unit that is also found in the SEAT Leon. The performance is effortless and smooth, and it covers the 0-62mph sprint in 8.5 seconds. The 1.4-litre petrol, meanwhile, is boosted by Cylinder Deactivation Technology that pegs back the economy to 52.4mpg. You’ll barely even notice the technology, even when half your engine shuts down. A modest 1.0-litre three-pot petrol engine rounds off the range. Small, smooth and quiet, it punches above its weight and is a very viable option. There are a few low-rent plastics here and there, but they’re genuinely found in places you’re less likely to look or touch. Overall, the interior feels and looks good. All-round visibility is a plus point too, and SEAT has done well to make sure its bulky stance doesn’t impinge on what you can see. Practicality is overall good, and this is a very roomy car that can accommodate your family and luggage. Its boot is measured at 510-litres, though 4WD variants see their boots cut down to 485-litres for obvious reasons. This is a handsome interior. If your family has outgrown the SEAT Leon, you won’t need to settle for a functional, bland interior that puts practicality before style. Indeed, a lot of what is in here is actually derived from the Leon which means that the controls are user-friendly, with the heater controls especially easy to use. This new model features a rotary dial located on the centre console which gives you the chance to switch between a few different driver modes, including sport, eco and off-road. The boot also comes with a wide underfloor, while the rear seats split 60:40. They’re comfortable – but they don’t fold all the way down, which leaves a pronounced step. Access to the car is easy thanks to its height, and the doors open wide. Standard equipment across the range is good, with the S model featuring 16” alloys, a 5” touchscreen, tyre-pressure monitoring, 7 bags and driver drowsiness detection. The SE model adds 17” alloys, a leather steering wheel, twin-zone climate control and rear parking sensors. If you can get over its daft name, the range-topping XCELLENCE trim, meanwhile, throws in 18” alloys, leather upholstery, LED headlights, and chrome exterior trim. It feels like a prestigious, big car. Prices for this SUV start out from around £18,000 and rise to almost £30,000. If you want to lease it through contract hire over three years, you’d be looking at paying somewhere between £230 – £460 + VAT depending on what is included in your deal. Regarding running costs, the Ateca SUV should represent good value for your money. The 1.6-litre TDI diesel is the cheapest to run, and can return around 66mpg off a sensible drive while emitting 112g/km of CO2. It’s a performative engine and is our top pick. You can pair the more powerful 148bhp 2.0-litre diesel engine up with four-wheel drive, but this will raise running costs. Without 4WD it can return 63mpg, while with it’s only good for 58mpg. The range-topping 2.0-litre 187bhp diesel unit is capable of returning 56mpg. A warranty hasn’t yet been confirmed as we write this, but OSV expects SEAT to offer the standard 3-year/60,000 mile deal. The Renault Kadjar offers four-year cover, while the Kia Sportage comes with seven years cover. The big question was always going to be: Does this bulky SUV drive like a SEAT? We’re pleased to say that it does. It shares Leon’s mechanical platform and also a fair amount of its handling characteristics. The ride is firm yet supple, and you always feel involved. The grip is solid, and the steering reacts rapidly to even small movements. Move up the range and you’ll also get the added bonus of the SEAT Drive Profile, which lets you customise the steering, gearshifts and throttle response. Styling is crucial in this sector these days. The Nissan Qashqai really raised the bar, and it was so important that SEAT delivers a car that looks good. It borrows its wheelbase from the Leon, but it’s a lot taller. The Ateca has borrowed a lot of things from the Leon – including the interior. The overall look is familiar, and everything is logically arranged. Spending a lot of your time in here is a pleasure, thanks to soft and high-quality materials and a dashboard that is easy to use. Most cars of this type come with adaptive dampers, even if just as an option. But the total absence of adaptive dampers here could be a deal breaker for some buyers, especially if you’re looking to take this car off-road occasionally. The ride is firm enough at the best of times. While the mid and top-range models come with a classy and intuitive infotainment system that is also housed in a Skoda, the entry-level variant has to make do with a rather pithy and underwhelming 5” screen that looks as cheap as it probably is. Because of this, you can’t get navigation on entry-level models. The Ateca is SEAT’s first attempt at such a hefty family car. 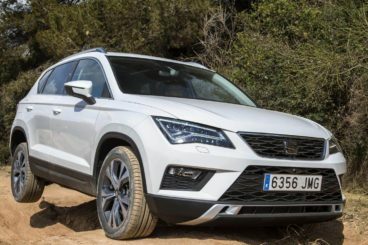 If you’re concerned that it might be a rough copy, let’s take a look at how it measures up against its closest rivals in the comparison section of our SEAT Ateca SUV review. The Nissan Qashqai is a runaway success and has sold in its millions around the world. Whether Nissan anticipated such resounding feedback is anyone’s guess, but the second generation variant is even better than the original. 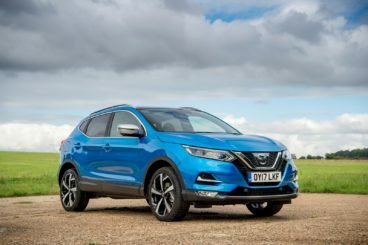 But let’s start with its weaknesses: The new Qashqai is bulkier than last time around, and when you add in the optional four-wheel drive system, your running costs will take a hit. There are at lease a few positives to be taken from the extra weight. For example, the Qashqai looks more expensive than its predecessor, and is still stylish, sleek – and even more commanding. The seven-door model has been discarded altogether, which has freed Nissan’s designers up to create something decidedly sexier. 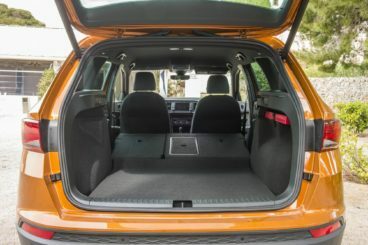 The increase in size also means that rear seat passengers benefit from more leg and headroom, while the already large boot is now 43-litres bigger and measures at 430-litres. It can’t compete with the Ateca’s 501-litre boot, however. The interior overall is a pleasant place to be, though. Metallic finishes, atmospheric lighting and upmarket stitched leather trims make good on the promises suggested by the car’s slick exterior. Unlike in the SEAT, you won’t be grimacing at hard-to-spot hard plastics because there aren’t any. The Ateca struggles for class-leading economy, thanks largely to its size. The improved Qashqai has fewer problems in this area and it’s cheapest engine is the 1.5-litre dCi diesel engine which is capable of returning 74.3mpg. The cheapest to run unit in the Ateca range is good for 66mpg. Both cars offer 4WD as an option, and this does improve handling off-road, but the Qashqai is far from being a capable off-roader. At the same time, the Ateca would have more steel in wetter conditions if only SEAT had included adaptive dampers. Overall, the Qashqai has a bit of an edge because it’s already shifted 2,000,000 copies and is now well into its second generation. Like the Qashqai, this Volkswagen Tiguan is a second generation model that retains all the key elements that made the original such a success. Calling on its predecessor’s strong sales record, VW just had to double down on everything that made it so good in the first place. Believing that a chain is only as good as its weakest link, though, we’re going to start with this car’s weaknesses: Running costs. 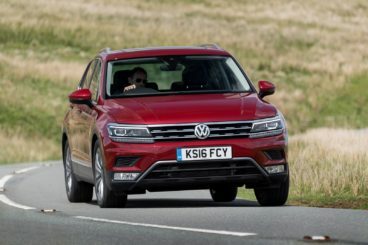 The cheapest engine to run in the Tiguan’s range is a 2.0-litre TDI BlueMotion diesel which comes in two power guises and can only return a feeble 56.5mpg off a sensible drive. Moreover, it’s going to lump you with a road tax bill of £110 per year. So despite its reasonable listing price, it’s only going to make financial sense to average-mileage drivers. Its range of engines have not been fully fleshed out yet, and more petrol and diesel units are expected to be added to its 2.0-litre diesel powerplant throughout 2016. The 2.0-litre diesel comes in various guises, and all have excellent pulling power and a very refined and quiet nature. 4WD is available as an option for added bear-like power. On the road, the VW Tiguan is a real pleasure to drive. Take her off-road and onto murkier terrain, and she sets new standards for a car of this type. Although it isn’t a wilder beast rampaging through the mud at midnight or anything like that, it’s highly capable. It’s also super comfortable and good fun to drive, its drivability underpinned by VW Group’s modular architecture. It’s as agile as they come. This second generation variant is bigger than last time around, which means more space upfront and in the back. Interior quality has been improved, although it suffers from the same hard-to-spot-at-first hard plastics like the ones found in the SEAT Ateca. Overall, though, it’s well assembled. If you can afford to run it, it’s worth a closer look. SEAT are venturing into unchartered waters with this one, as massive SUV’s is not something they’re experienced with. The SEAT Leon was already popular over here, so what did SEAT decide to do? Build a large SUV based on the Leon. They’ve pulled it off, too. This car shares the same mechanical platform as its stablemate, which ensures an entertaining ride. It also largely shares its classy interior and keeps running costs down as much as possible, too. It’s competitively priced and with the option of four-wheel drive the SEAT Ateca SUV makes for a very stylish, and very impressive addition to a bloated market. 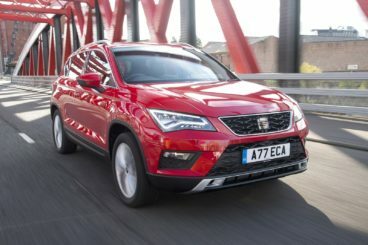 Looking For A Price For The SEAT Ateca SUV?